Some people can find generating ideas can be a challenging task, whereas a flood of ideas come to others extremely naturally. Being great at generating ideas is one of those rumoured skills that if you’re not born with the talent you’ll never have it, but that’s just not true. Anyone can generate a wealth of ideas but this skill requires practice and time to develop before it will become natural to think up great ideas from nothing. There are a number of techniques that many people use when generating ideas. They can be applied to any situation and can be used for individual and team brainstorming sessions. In this post, I’ll discuss a few techniques that I have used when I start a new project and need to get a fresh set of ideas. This is possibly the simplest and most effective way to gather ideas about any topic. The topic name is written in the centre of a piece of paper and whenever you think of an idea relating to that topic you write the idea down around the edge of the paper and draw a line from the topic in the centre to the idea. This is a very effective method for teams or individuals brainstorming. Many find that ideas are usually thought of when you’re not actively focusing on creating an idea. For this reason I recommend that you carry a notebook and pen around with you at all times. That way anytime you get an idea, you will always have something to write it down in. And, all of your ideas will be collected neatly in one book and not on multiple pieces of paper which can be easily lost. Usually used in mathematical problems, tree diagrams are very effective when used to generate ideas. To create a tree diagram you write the name of a topic in the centre on the top of a piece of paper and draw two vertical lines coming off of the topic. You then generate two related topics from that one and draw two vertical lines coming off of each of those topics. Then you just keep on going until you can’t think of anything else. Applying different conditions and restrictions to the topics that you generate will also help you to develop a new ideas. Gather a pack of index cards and write a random word on each one, then add these to a bowl and pick two (or three) cards out at random. This can yield many strange ideas mainly because of the way that the idea is randomly generated but this is only a starting point. Generating lots of ideas is the key, no matter how weird they sound. Refining your ideas are a different matter and something we’ll discuss later. Although you may have many ideas whilst doing other activities this doesn’t mean that those environments are the best at helping you to generate ideas. Find an environment that is right for you so that you’ll happily be able to stream off a long list of ideas. That may mean totally rearranging your work area or finding a new quiet spot to work. Whatever you think you need, do it and let the ideas flow free. Moving yourself into a similar environment that will be used in your product (or that your product is used in) may also help you generate ideas. It’ll give you a better understanding of the real-life limitations of the environment. You could decide whether to incorporate these into your own project it may make it more realistic. or, choose to go against these limitations and give your player a new experience if you’ve creating a game. Research can be used to strengthen ideas or to generate new ones. If you have a limitation on the idea you wish to generate, research is a great way to further explore that idea. It will also help you to gather other useful information that you may need later on in the production phases for example, images that can be used to generate concept art or wireframes. Once you’ve generated your ideas, it is important for you to store and record them appropriately. A good way to do this is to use a notebook (like I mentioned earlier). However, if you don’t want to carry one around with you daily you can choose to write ideas on loose pieces of paper. Just make sure that you get into the habit of transferring your ideas into a more permanent and secure storage option, like a notebook or even a spreadsheet. Before you enter in a long list of every idea that has come to you along the course of the day, start by creating the database and dividing it into categories i.e. by genre. Then separate those categories into subcategories. Now fill in the database putting each idea into the correct category. Do this every night for seven days and you’ll see how many ideas you can actually generate. So now you have your next idea you could jump in and start developing it, but I would recommend you do some market research. Is this idea something that only you think is good and useful? Or, will others want it too? It’s important to validate your idea even if it’s only a little. Don’t get me wrong. It’s completely fine to build a product that’s just for you, but if you want people to actually buy what you’ve created, you’ll need to take into account other people’s opinions. A good book to help you figure out if your new idea is a good one to pursue is Will It Fly? By Pat Flynn. 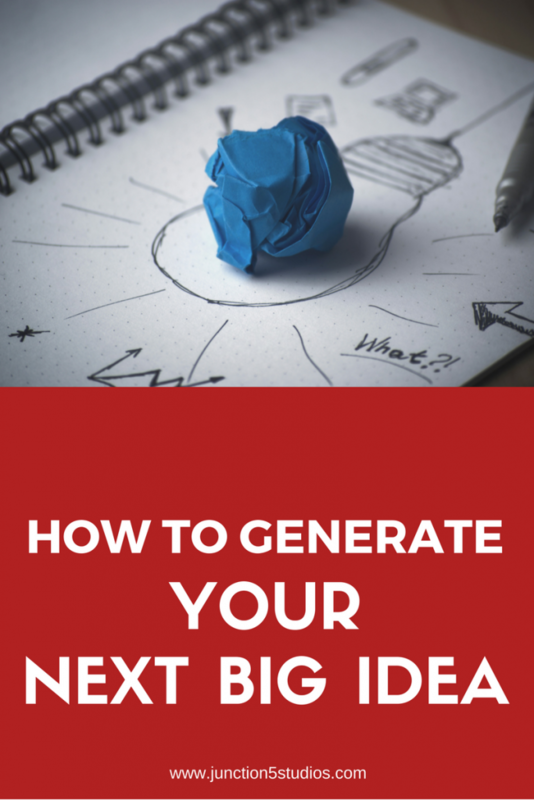 The more you continue to use idea generation methods, the faster you’ll find you’re able to generate ideas. If you use a different technique or know of any others to generate ideas, post a comment below and tell me how effective they are.